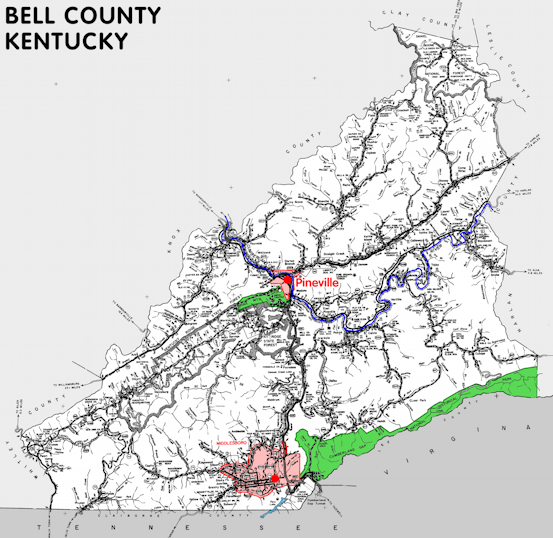 Bell county is in the Eastern Coal Field region of Kentucky. The elevation in the county ranges from 975 to 3500 feet above sea level. It was formed in 1867 from Harlan and Knox counties. The county seat is Pineville. In 2010 the county population was 28,691 in a land area of 359.00 square miles, an average of 79.9 people per square mile. The equine population was 200 in the 2012 Kentucky Equine Survey. Bell county is in the Cumberland Valley Area Development District. Bell county was originally known as Josh Bell county for Joshua Fry Bell, Kentucky legislator. It was shortened to just Bell in 1873. The Cumberland Gap is in Bell county, just south of Middlesborough, on the border between Kentucky and Tennessee.